Monks final quartet and sixth studio album, produced by Columbia’s Teo Macero, the man behind a lot of Miles Davis. 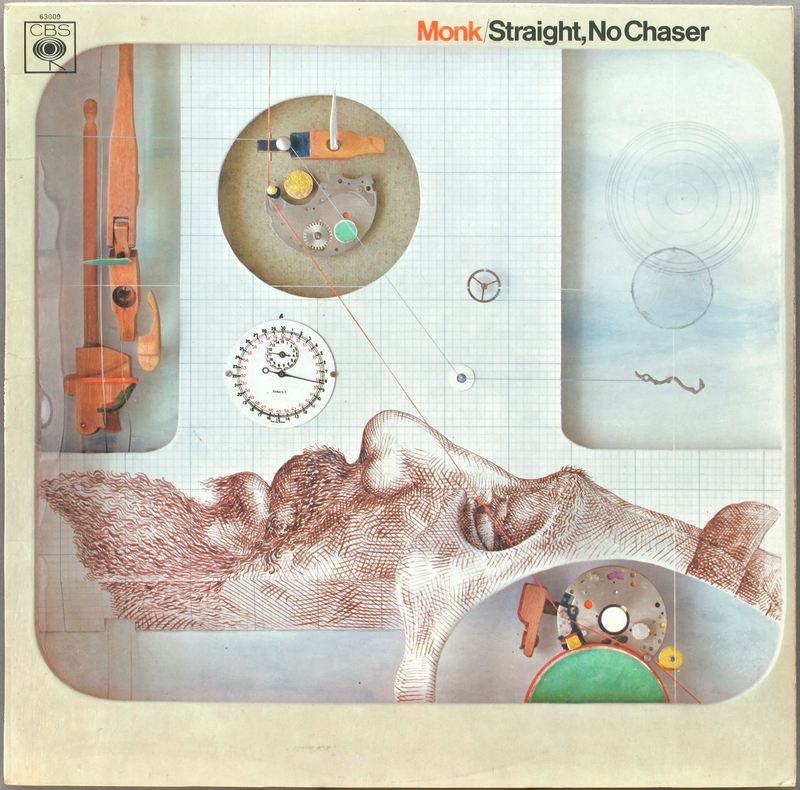 This has to be Monk’s finest album, apart from all the others. The title track is best known among the DJ-tendancy, due to its “hard-drinking, cool bartending” attitude, but my preference is for the marvelous Locomotive, best known among recovering train spotters. I can’t get the tune out of my head (apologies to Kylie). 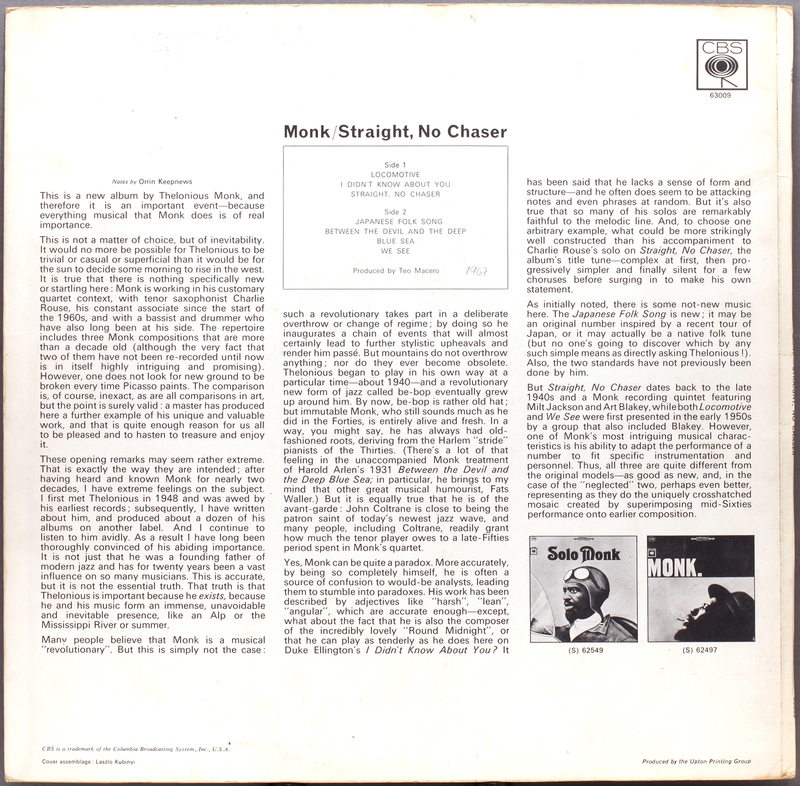 Charlie Rouse is totally in sync with Monk’s thinking, and offers up some of his best playing, sometimes angular echoing Monk, but with nifty figures in a warm rounded tone. The whole album is very rhythmic and hard-swinging. Vinyl: BPG 63009 UK mono from 1967, rough-texture orange label. No doubt there is a Columbia 32-eye or whatever closer to the original but this has an exceptionally nice, well-behaved mono delivery, with good dynamic range and punch. 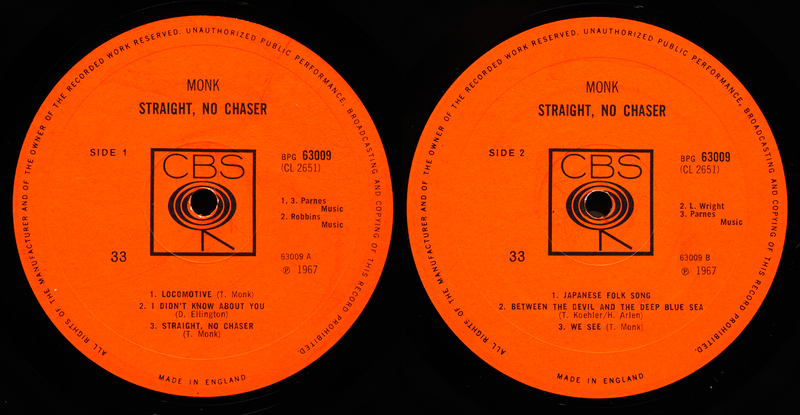 No argument about stereo positioning, nothing to interfere with the enjoyment of arguably Monk’s best studio recording. Or did I write that about one of his previous recordings? After several eBay auctions with eye-popping prices, it’s nice to play catch up with classic records at a sensible cost, Moscow and Tokyo obviously preoccupied with bigger fish. This entry was posted in CBS, Thelonius Monk and tagged Ben Riley, Charlie Rouse, Larry Gales, Thelonious Monk by LondonJazzCollector. Bookmark the permalink. Manmatty, you’re right, and on CHASER Japanese Folk Song is, I believe, less than half the length it is on the CD reissue. Even so, I’m not convinced that more isn’t sometimes…less. I love this Monk album and I’ve played it to the hilt. I, as always, own it on CD and as is the case with the Charles Mingus Ah Um reissue on Sony’s Legacy series, this reissue, too, contains all the album tracks in their original, unedited length. Check. Great track and great cover. Do graphic designers and illustrators work for publishers any more? Seems they usually get the work experience lad to download a generic photo and whack it on the front of their ‘product’, which at least keeps the accounts department happy. Seems to me covers are too often designed by the producer’s talentless wife or girlfriend (possibly both). Francis Wolff and Reid Miles , where are you in our hour of need?